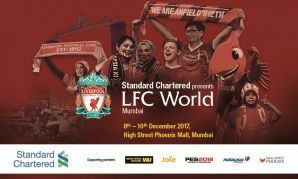 In December 2017, LFC World took place at the High Street Phoenix Mall, Mumbai, from Friday 8th to Sunday 10th December 2017. 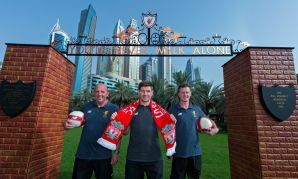 Fans had the chance to meet LFC Legends – Robbie Fowler, Vladimir Smicer, Luis Garcia and Sami Hyypi as well as meet our LFC Official Club mascot, Mighty Red. Experience the dressing room photo station where you can sit under the shirts of your favourite players – Sadio Mane, Roberto Firmino and Mohamed Salah. Have your photo taken with one of the most iconic trophies in world football - the UEFA Champions League Trophy. ‘Inside Anfield’ - a sneak peek into Anfield, made possible by Standard Chartered Bank, that puts you in a player’s shoes and gives a unique insight into the team’s inner sanctum. Experience how it feels to be in a Jürgen Klopp team talk in the dressing room, and walk out from the players’ tunnel in front of the home crowd. Score in front of The Kop - experience the drama, scale and excitement through a state of the art VR experience that is the first of its kind. Used by professional footballers, it will put you in the shoes of an LFC player and give you the rush of scoring in front of the Kop at Anfield. Kop Cinema - an immersive motion picture to give fans the feeling of matchday at Anfield as well as other highlights from the Club’s history. 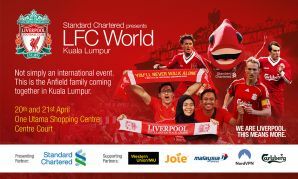 Watch all the highlights of LFC World Mumbai Lumpur below. High Street Phoenix is the first retail led consumption centre developed in India over a sprawling 3.3 million square feet. It houses over 500 brands including a variety of F&B, entertainment, commercial and residential complexes.